In support of Breast Cancer Awareness Month, Clinique offers a special, jumbo-sized bottle of its best-selling, cult classic Dramatically Different Moisturizing Lotion +. 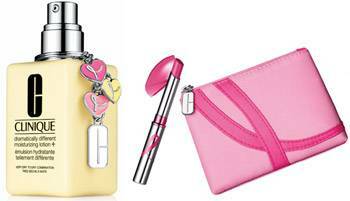 The limited edition bottle is nearly twice the size of a regular bottle and adorned with a Clinique key ring with 'C" shaped charm. Amount of Donation:$10.00 from every sale of this limited-edition Dramatically Different Moisturizing Lotion + to benefit The National Breast Cancer Foundation while supplies last. To help raise awareness for Breast Cancer Awareness Month, Clinique has created an exclusive shade of its iconic Almost Lipstick. This limited edition Almost Lipstick comes in a beautiful pink colour: Pink Ribbon Honey, and is housed in a convenient pink cosmetic carrying pouch. Amount of Donation: $5.00 from every sale of this limited-edition Almost Lipstick to benefit The National Breast Cancer Foundation while supplies last.